In October 1998, U.S. Senator Daniel Patrick Moynihan testified before Congress on acid rain. A longtime champion of the issue, Moynihan stated that "As far back as the 1960s, fishermen in the Adirondacks began to complain about more than 'the big one that got away.' Fish, once abundant in the pristine, remote Adirondack lakes, were not just getting harder to catch. They were gone." The issue of acid rain emerged in the United States in the mid-1970s. At the time, little was known about the magnitude and distribution of acid rain or about its impacts on terrestrial (land-based) and aquatic ecosystems . However, many believed that acid rain and the air pollutants that caused it posed a threat to forests, aquatic life, crops, structures (e.g., buildings), cultural artifacts (e.g., statues and monuments), and human health. Since the 1970s, acid rain has been addressed in the United States through hundreds of millions of dollars of research, passage of laws, and implementation of regulatory programs. However, Senator Moynihan's 1998 remark is stark testimony to the fact that acid rain continues to have a negative effect on natural resources, and addressing the problem is an enduring public policy dilemma. Rain, snow, sleet, and other forms of precipitation are naturally slightly acidic because of chemical reactions with carbon dioxide and other naturally occurring substances in the atmosphere. But this natural acidity can be increased by human-induced air pollution. Acid deposition or "acid rain" occurs when emissions of sulfur dioxide (SO 2 ) and oxides of nitrogen (NO x ) in the atmosphere react with water, oxygen, and oxidants to form mild solutions of sulfuric acid or nitric acid. Sunlight increases the rate of most of these reactions. These compounds fall to Earth and are deposited in either wet form (e.g., rain, snow, sleet, and hail), known as wet deposition, or dry form (e.g., particles, gases, and vapor), known as dry deposition. Cloud or fog deposition, a form of wet deposition, occurs at high elevations and in coastal areas. 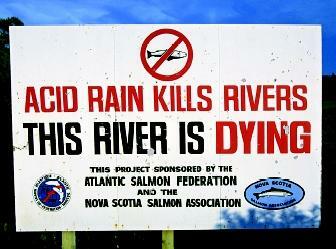 A sign in Nova Scotia, Canada proclaims the potential effect of acid rain on a local river and its salmon runs. Acidified waters can be harmful or even deadly to salmon populations. and industrial processes are the other major categories of emission sources. Acid rain is a regional problem because prevailing winds can transport SO 2 and NO x emissions over hundreds of kilometers, sometimes crossing state, national, and international borders. Wet deposition of sulfur and nitrogen compounds is commonly known as acid rain, although it also takes the form of snow, sleet, clouds, or fog. Wet deposition is intermittent because acids reach the Earth only when precipitation falls. Nevertheless, it can be the primary pathway for acid deposition in areas with heavy precipitation. The eastern United States receives more acidic precipitation than the rest of the country, with the greatest rates occurring in Ohio, West Virginia, western Pennsylvania, upstate New York, New England, and other northeastern areas. Because nitrogen compounds can remain stored in snow until it melts, nitrate concentrations in lakes and streams can increase dramatically during seasonal or episodic acidification, particularly in the Northeast, resulting in toxic impacts on aquatic organisms. Acidic compounds can reach plants, soil, and water from contact with acidic clouds as well. Although cloud deposition affects only a limited number of locations, it can provide a relatively steady source of acids in comparison with wet deposition, particularly at high altitudes. As a result, trees such as the red spruce have declined in areas of significant cloud deposition. Dry deposition occurs when acidic gases and particles in the atmosphere are deposited directly onto surfaces when precipitation is not occurring. Dry-deposited gases and particles can also be washed from trees and other surfaces by rainstorms, making the combination more acidic than the falling rain alone. Dry deposition is the primary acid deposition pathway in arid regions of the West, such as Joshua Tree National Park. The ecological effects of acid rain are most clearly seen in aquatic environments, particularly streams and lakes. Acid rain mainly affects sensitive bodies of water that are located in watersheds whose soils have limited ability to neutralize acidic compounds. The ability of forest soils to neutralize acidity, referred to as buffering capacity, results from chemicals in the soil that neutralize some or all of the acidity in rainwater. Buffering capacity depends on the thickness and composition of the soil as well as the type of bedrock beneath the forest floor. Lakes and streams become acidic ( pH decreases) when the water itself and its surrounding soil cannot neutralize the acidity in the rain. Differences in soil buffering capacity are an important reason that some areas receiving acid rain show damage, whereas other areas receiving about the same amount of acid rain do not appear to be harmed. Several regions in the United States contain many of the surface waters sensitive to acidification. They include the Adirondacks and Catskill Mountains in New York State, the mid-Appalachian highlands, the upper Midwest, and mountainous areas of the western United States. In areas such as the northeastern United States, where soil buffering capacity is low, some lakes have a pH value of less than 5. With a pH of 4.2, Little Echo Pond in Franklin, New York was one of the most acidic lakes reported as of 2002. Acid rain is not the sole cause of low pH in lakes and streams. There are many natural sources of acidity that can drive down pH to low levels (as low as 4) even in the absence of acid rain: for example, organic acid inputs or mineral veins in underlying geologic materials. Similarly, natural sources of buffering capacity such as limestone bedrock can push pH to as high as 8. Notwithstanding these natural influences in specific locations, lakes and streams generally have pH values from 6 to 8. Hence, reductions in pH due to human-induced acid rain create an imbalance in the chemistry and ultimately the entire ecosystem of a lake or stream. Acid rain causes a cascade of effects that harm or kill individual fish, reduce fish populations, completely eliminate fish species from a waterbody, and decrease biodiversity . As acid rain flows through soils in a watershed, aluminum and other metals are released from soils into the lakes and streams located in that watershed. Thus, as a lake or stream becomes more acidic (has lower pH), aluminum levels increase. Both low pH and increased aluminum levels are directly toxic to fish. In addition, low pH and increased aluminum levels cause chronic stress that may not kill individual fish but may make fish less able to compete for food and habitat. The impact of declining pH varies because not all aquatic organisms can tolerate the same amount of acid. For example, frogs are better able than trout to tolerate somewhat acidified water. Generally, the young of most species are more sensitive to environmental conditions than adults. As pH levels decline, acid-sensitive species may attempt to migrate to better habitat, or, if blocked from migration, will likely die. At pH 5 and below, most fish species disappear, and ecosystem-level processes are affected. Some acid lakes and streams contain no fish. Acidified lakes and streams can be treated with agricultural lime in an attempt to counteract the acidity. Such temporary and localized measures are not as effective as emissions reductions in addressing the long-term and geographically widespread ecological impacts of acid rain. Acid rain has been implicated in forest and soil degradation in many areas of the eastern United States, particularly high elevation forests of the Appalachian Mountains from Maine to Georgia. Acid rain does not usually kill trees directly. Instead, it weakens trees by damaging their foliage, limiting the nutrients available to them, or exposing them to toxic substances slowly released from the soil. Quite often, injury or death is a result of acid rain in combination with other environmental stressors, such as insects, disease, drought, or very cold weather. Chemicals in watershed soils that provide buffering capacity (such as calcium and magnesium) are also important nutrients for many species of trees. As forest soils receive year after year of acid rain, these chemicals are washed away, depriving trees and other plants of essential soil nutrients. At the same time, acid rain causes the release of dissolved aluminum into the soil water, which can be toxic to trees and plants. The chemicals that provide buffering capacity take many decades to replenish through gradual natural processes, such as the weathering of limestone bedrock. Trees also can be damaged by acid rain even if the soil is well buffered. Mountainous forests often are exposed to greater amounts of acidity because they tend to be surrounded by acidic clouds and fog. Essential nutrients in foliage are stripped away when leaves and needles are frequently bathed in acid fog, causing discoloration and increasing the potential for damage by other environmental factors, especially cold weather. The pollutants that cause acid rain also damage human health. These gases interact in the atmosphere to form fine sulfate and nitrate particles that can be inhaled deep into the lungs. Scientific studies show relationships between elevated levels of fine particles and increased illness and premature death from heart disease and lung disorders, such as bronchitis. In addition, nitrogen oxides react in the atmosphere to form ozone , increasing risks associated with lung inflammation, such as asthma. Sulfates and nitrates in the atmosphere also contribute to reductions in visibility. Sulfate particles account for 50 to 70 percent of decreased visibility in eastern U.S. national parks, such as the Shenandoah and the Great Smoky Mountains. In the western United States, nitrates and carbon also play roles, but sulfates have been implicated as an important source of visibility impairment in some national parks, such as the Grand Canyon. Wet and dry acid deposition contribute to the corrosion of metals (such as bronze) and the deterioration of paint and stone (such as marble and limestone). These effects seriously reduce the value to society of buildings, bridges, cultural objects (such as statues, monuments, and tombstones), and automobiles. In 1990, the U.S. Congress took action intended to address acid rain issues, passing the Clean Air Act Amendments (CAAA) (42 U.S.C. 7651). The purpose of the Acid Rain Program (Title IV of the 1990 amendments) was to address the adverse effects of acid rain by reducing annual emissions of sulfur dioxide (SO 2 ) and nitrogen oxides (NO x )—the main air pollutants that cause the problems—from stationary power generation sources. Implemented by the U.S. Environmental Protection Agency starting in 1995, the program consists of two major components. The SO 2 emission reduction program employs a two-phase cap-and-trade approach to reduce total annual SO 2 emissions by 10 million tons below 1980 levels by 2010 (roughly a 40-percent reduction in total emissions). When the SO 2 emission reduction is fully implemented in approximately 2010, electric utility emissions will be capped at 8.95 million tons per year (representing approximately a 50-percent reduction in emissions from this sector). The NO x emission reduction program aims to reduce annual NO x emissions from coal-fired electric utility boilers by 2 million tons below what they would have been without Title IV. The NO x component of the program does not include a cap on NO x emissions or any emissions trading provisions. In establishing the Acid Rain Program, Congress chose to utilize an innovative environmental management approach known as capand-trade, or emissions trading, to reduce SO 2 emissions. Emissions trading is a departure from more traditional "command and control" regulatory approaches in which the government commands industry to install particular control technologies at specific plants in order to reduce pollution. Because emissions trading allows industry the flexibility to reduce pollution from sources that can achieve reductions least expensively, large amounts of emissions are reduced at lower costs, with less administrative burden and fewer lengthy lawsuits, than if sources were regulated individually. The approach first sets an overall cap (maximum amount of emissions) that policymakers believe will achieve the desired environmental effects. Affected sources are then allocated emission allowances that permit them to emit a certain amount of a pollutant. The total number of allowances given to all sources cannot exceed the cap. Sources are not told how to reach the emissions goal established by the number of allowances they are given. They may reach their goal through various means, including buying allowances from sources that are able to reduce emissions more cost effectively and so have excess allowances to sell. The only requirements are that sources completely and accurately measure and report all emissions and then turn in the same number of allowances as emissions at the end of the yearly compliance period. If emissions exceed allowances, a source faces expensive fines and other penalties. The mandatory cap always protects the environment. Even as the economy grows, or as new sources enter the industry, total emissions cannot exceed the cap. Complete and consistent emissions measurement and reporting by all sources guarantee that total emissions do not exceed the cap and that individual sources' emissions are no higher than their allowances. The design and operation of the program is simple, which helps keep compliance and administrative costs low. In terms of SO 2 emissions reductions, the results of the Acid Rain Program have been dramatic—and unprecedented. From its 1995 inception to 1999 (completion of Phase I), annual SO 2 emissions from the largest, highestemitting sources dropped by nearly 5 million tons from 1980 levels. These reductions were an average of 25 percent below required emission levels, resulting in early achievement of human health and environmental benefits. In 2001, SO 2 emissions from power generation were more than 6.7 million tons below 1980 levels. Emissions of NO x have been reduced by 1.5 million tons from 1990 levels (about 3 million tons lower than projected growth). Because the NO x component of the program includes no cap, there is no guarantee that NO x emissions will stay at these low levels; without a cap, emissions may increase as power generation increases. Because of the reduction in SO 2 emissions, acidity of rainfall in the eastern United States has dropped by up to 25 percent. As a consequence, some sensitive lakes and streams in New England are showing signs of recovery. Further, sulfate concentrations in the air have decreased, leading to improved air quality and associated benefits to public health, such as fewer irritations or aggravations to respiratory conditions (e.g., asthma and chronic bronchitis). Finally, visibility has improved in some parts of the eastern United States, including areas with scenic vistas, such as Acadia National Park in coastal Maine. Although the Clean Air Act has had positive effects, emissions and acid deposition remain high compared to background conditions. The rate and extent of ecosystem recovery from acid deposition are directly related to the timing and degree of emissions reductions. Research suggests that deeper emissions cuts will lead to greater and faster recovery from acid deposition in the northeastern United States. SEE ALSO Amphibian Population Declines ; Cavern Development ; Chemical Analysis of Water ; Ecology, Fresh-Water ; Fresh Water, Natural Composition of ; Fresh Water, Physics and Chemistry of ; Karst Hydrology ; Lakes: Chemical Processes . Dehayes, Donald et al. "Acid Rain Impacts on Calcium Nutrition and Forest Health." Bioscience 49 (October 1999):789–800. Driscoll, Charles T. et al. Acid Rain Revisited: Advances in Scientific Understanding Since the Passage of the 1970 and 1990 Clean Air Act Amendments. Hanover, NH: Hubbard Brook Research Foundation, 2001. Available online at <http://www.hubbardbrook.org/hbfound/report.pdf> . Driscoll, Charles T. et al. "Acidic Deposition in the Northeastern U.S.: Sources andInputs, Ecosystem Effects, and Management Strategies." Bioscience 51, no. 3 (March 2001):180–198. Driscoll, Charles T. et al. "The Response of Lake Water in the Adirondack Region of New York State to Changes in Acid Deposition." Environmental Science and Policy 1 (1998):185–198. Ellerman, A. Denny et al. Markets for Clean Air: The U.S. Acid Rain Program. New York: Cambridge University Press, 2000. Kosobud, Richard F., ed. Emissions Trading: Environmental Policy's New Approach. NewYork: John Wiley & Sons, 2000. Likens, Gene E., Charles T. Driscoll, and D. C. Buso. 1996. "Long-Term Effects ofAcid Rain: Response and Recovery of a Forest Ecosystem." Science 272 (12 Apr. 1996):244–246. Lovett, Gary. "Atmospheric Deposition of Nutrients and Pollutants in North America: An Ecological Perspective." Ecological Applications 4, no. 4 (1994):629–650. Stoddard, John L. et al. "Regional Trends in Aquatic Recovery from Acidification inNorth America and Europe." Nature 401 (7 Oct. 1999):575–578. U.S. Environmental Protection Agency, Clean Air Markets Division. 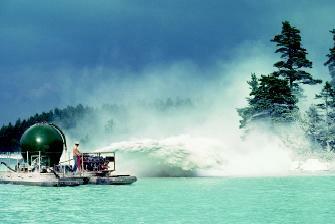 EPA Acid Rain Program—2001 Progress Report. EPA-430-R-02-009. Washington, D.C.: U.S. Environmental Protection Agency. Available online at <http://www.epa.gov/airmarkets/cmprpt/arp01/index.html> . Clean Air Markets. U.S. Environmental Protection Agency. <http://www.epa.gov/airmarkets> . National Acid Precipitation Assessment Program. <http://www.oar.noaa.gov/organization/napap.html> . National Atmospheric Deposition Program. <http://nadp.sws.uiuc.edu/> . Nilles, Mark A. Atmospheric Deposition Program of the U.S. Geological Survey. U.S. Geological Survey. <http://bqs.usgs.gov/acidrain/Program.pdf> . The buildings and monuments of Washington, D.C. use many types of stone. Marble and limestone structures are the most likely to show damage caused by acid precipitation and urban pollution. They are vulnerable to accelerated deterioration because they are composed primarily of the mineral calcite (calcium carbonate), which dissolves readily in weak acid. The United States Capitol building shows evidence of stone deterioration. For example, preferential dissolution of calcite (where the silicate mineral inclusions remain) has caused pockmarks in marble columns and balustrades and their square bases. Although stone deterioration has many causes, both natural and human-induced, it is almost certain that some deterioration can be attributed to acid rain. Clearly we can help by carpooling, walking, taking less trips, bicycling--anything to reduce our time in cars. If possible, buy a car that does not emit so many pollutants.